CE COMPLIANCE CERTIFICATE in the field of design, manufacture and final inspection for cardiac monitoring teleECG devices and cooperating software: EHO12, EHO-MINI Event Holter, EHO-MINI Event Rehabilitation, software CardioScp, software CardioScp WEB. The certificate confirms the quality assurance of the manufacturer of medical devices in the design, manufacture and final inspection of medical devices. The certificate confirms compliance with the requirements of Annex II of Directive 93/42/EEC concerning medical devices, introduced into Polish law, proof of which was provided by the audit carried out by TUV NORD Polska Sp. z o.o. - CE 2274. CERTIFICATE OF FREE SALE in the field of the teleEKG® cardiac monitoring at a distance system with CardioScp software and EHO-MINI, EHO12 devices. The certificate is intended to facilitate export for a product marked with the CE sign and a product made to order. It was issued by the President of the Office for the Registration of Medicinal Products, Medical Devices and Biocides. 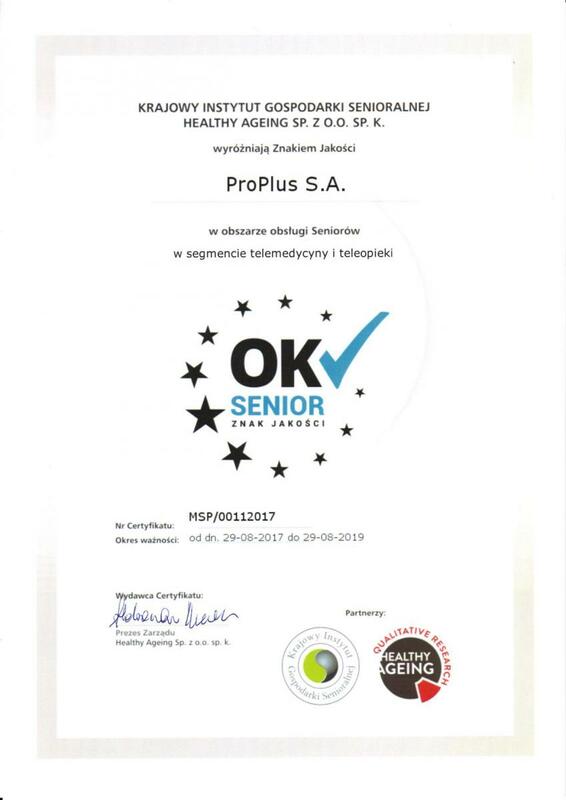 OK SENIOR Quality Mark is a certification program for personnel, goods and services for older people, in cooperation with the National Institute for Senior Support, Public Consulting Group, TÜV Rheinland Polska and the Polish Promotional Emblem Foundation "Teraz Polska".